BRAND NEW HOME - MOVE IN READY! 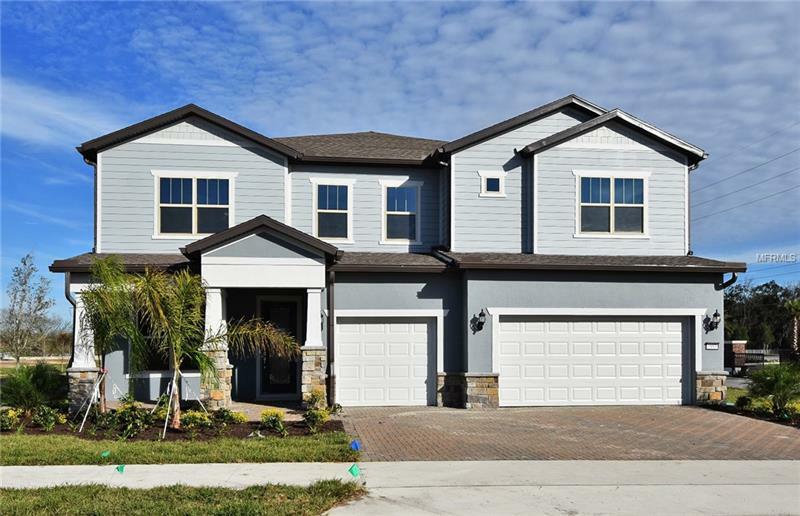 Come live the Oviedo lifestyle in this stunning 2-story home in the Brookmore Estates community. This NEW Casabella floor plan greets you as you park in your three car garage/driveway and walk up the Brick Paved Driveway. The front den would make a perfect home office for privacy and quiet. First floor master bedroom with extended super shower featuring tile listello and gorgeous quartz countertops. The dining room is conveniently set aside from the large open gathering room and cafe with stunning wood-look tile floors throughout including the kitchen. The NEW gourmet kitchen with features gorgeous White 36â/42â Staggered Cabinets, Light Colored Quartz Counter Tops and NEW Built-in Stainless-Steel Kitchen Aid Appliances featuring a Counter Depth Refrigerator. Large Sliding Glass Door to your huge 31âx10â extended covered lanai with Brick Pavers, overlooking a huge corner lot with a water view home-site that is perfect for entertaining. The home features an enormous loft, separate media room and five oversized bedrooms and four bathrroms on the second floor (3 of them feature on-suite bathrooms). This is a must see home!